An unexpected Variety assignment turned out to be the most fun in weeks: I was asked to interview the director and sound designer for Baby Driver as part of Variety’s “Oscar Innovators” series, which ran in a special issue on Thursday. Director Edgar Wright corrected me at the very start — this wasn’t a film that was edited to music but rather choreographed to it. Sound designer Julian Slater, who is up for Oscars in both sound editing and sound mixing categories, explained what he had to do and why the job was so complicated. 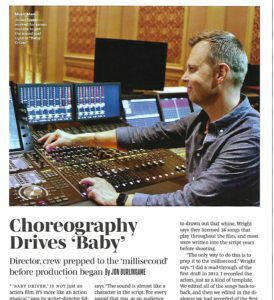 This entry was posted in Film Sound, Interviews and tagged Baby Driver, Edgar Wright, Julian Slater, sound editing Oscar, sound mixing Oscar, Variety on February 23, 2018 by Jon Burlingame.